The famous 1912 sinking tells us something eternal. Life, even the most privileged, is like an ocean voyage, and then the ship goes down and you die. It also seems like a warning against modern hubris. But an iceberg couldn’t stop the spread of ever more advanced technologies. Eike Batista may be the richest man in Latin America’s biggest economy, but he runs a cash-hungry empire. His sprawling oil and mining group is in its infancy. The $2 bln infusion of patient Abu Dhabi money should help Batista try to make good on his promise. The Dutch courier’s $6.8 bln sale to UPS is a rare victory for activist investors after a lean patch in Europe. They are likely to score again with the $2 bln buyout of Britain’s Misys. Corporate stragglers: beware. Results like these will embolden troublemakers. The huge available synergies mean the $73 bln U.S. parcel giant could sweeten its takeover offer for its Dutch rival. TNT shareholders are for now expecting at least 9 pct more. But with rivals FedEx and DHL inhibited in varying ways, they may not get the bidding war they’d like. The Baltic Dry Index was a good crisis indicator in 2008. The measure of cargo ship rental costs just fell below the last-crisis low. End of the world? Probably not. World trade, well above pre-crisis peaks, is growing, albeit slowly. There’s just too much capacity on the seas. Investor scepticism over greedy valuations has forced Russian issues to be pulled or sent shares tanking. But the strong showing of Global Ports up 18 percent on the day of its London debut suggests issuers may begin to understand the need for an attractive discount. Sure, fuel price hikes and high fees penalise the truck drivers who staged last week's strikes. But pricier petrol is essential for a more balanced, less polluted China. If the authorities are too wary of upsetting vested interests, necessary reforms will be stifled. A railroad across Colombia, carrying coal westward and Chinese semimanufactured goods eastward, looks plausible. Colombia's infrastructure shortage is a major barrier to growth; efficient and rapid Chinese help in providing it could have a huge multiplier effect. There's financial logic in the Hong Kong conglomerate's plan to list some of its port operations. The tougher question is what to do with the proceeds. Investors have been pushing for Hutchison to up dividends. But repaying debt and investing in growth looks the wiser course. Hong Kong conglomerate Hutchison Whampoa is to take advantage of Singapore's taxefficient trust law to list its port operations there. The deal is payback for the city state's longstanding efforts to be a competitive financial centre. For Hong Kong, it's a wakeup call. Eike Batista s reputation for a golden touch has suffered from slashing the sale of OSX shares. Even so, the shipbuilder raised $1.6 bln, and the billionaire s investment has multiplied 100fold on paper. OSX s new shareholders are betting there s more upside to come. A $5.6 billion float of a firm with no profit evokes the internetbubble era. But rigbuilder OSX is a chance for investors to bet on the hot Brazilian oil sector and Eike Batista, the fastest riser on Forbes' rich list. The combination makes it sound more Amazon than Pets.com. It is easy to dismiss the shipping equipment maker's $2.2 billion exuberant listing as Shanghai IPO mania, but the premium rating makes sense. China has overtaken Korea to hold the world's largest ship order book and robust naval ambitions add extra buoyancy. 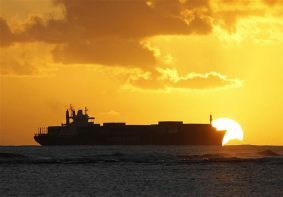 The world s largest container shipping line is gearing up for acquisitions days after reporting a $548m firsthalf loss. But a $1.6bn share placing could point to deeper insecurity about financing and the prospects for the whole shipping industry. The global shipping fleet is still growing at a record pace. But world trade is set to decline 9%. The excess supply will last for years. Shippers and their financiers may benefit from lower costs once trade recovers. But in the meantime, it's all about survival. The IMF has warned the downturn in global trade threatens a new chapter in the financial crisis. The problem is exacerbated by a shortage of trade finance. Governments should take notice. A boost in trade credit could keep problems in the weakest nations from getting too nasty. Too many ships, too little demand and expensive trade credit have pulled the Baltic Dry Index down 93% since May. That s dire, even for a cyclical industry. Netting counterparty risk might help a little, but shippers will remain at the mercy of the sputtering financial system. The cost of trade finance has shot up in the past year. Trust between counterparties is at a premium. Constrained bank balance sheets, currency fluctuations, and nervous counterparties add to the pain. The global economy could suffer severely. STX Group, a South Korean conglomerate, is dissatisfied with its business in lowmargin bulkcarriers. So it has mounted a formal takeover for Aker Yards ASA, the Nordic builder of cruise ships. But it looks like something got lost in translation between Oslo and Seoul.